One of the largest constellations seen in northern skies is Bootes. With 903 square degrees of sky, it is ranked 13 overall in size. There are seven stars with a magnitude of 3.5 or brighter that make up the asterism including brilliant Arcturus. Arcturus is a KIII red giant star located only 37 light years from Earth. It measures 25 times the size of the Sun or 32 million kilometres wide, in other words half the distance to the orbit of Mercury. A simple way to find this star is to ”follow the Big Dipper’s arc to Arcturus”. At magnitude 0.2 Arcturus is the fourth brightest star in the entire sky behind Sirius, Canopus (not seen from Canada) and Vega. Although Bootes is home to many galaxies, none of them are catalogued as Messier objects but never the less, nice objects to track down and observe. First locate the star called Seginus, a magnitude 3.0, class A7 white star locate 87 light years (ly) away that has stop fusing hydrogen in its core. 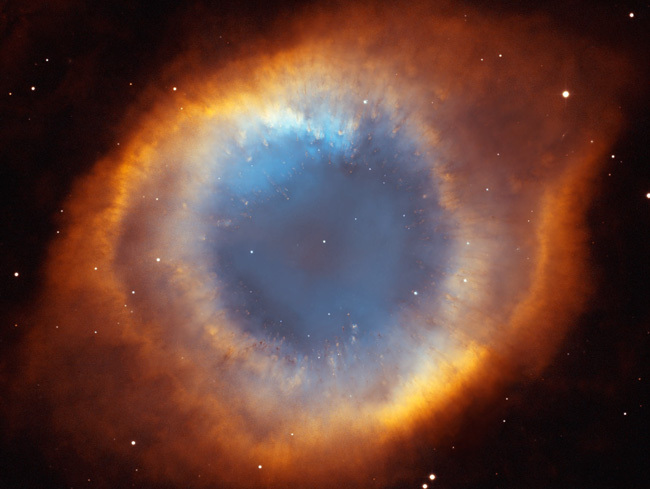 As the star will grow to red giant status and someday the core will collapse to the size of the Earth to become a planetary nebula something like the Helix Nebula. From Seginus move your telescope a little less than four degrees west to find NGC 5529, a thin edge on galaxy measuring 6.1 by .7 arc minutes in size. 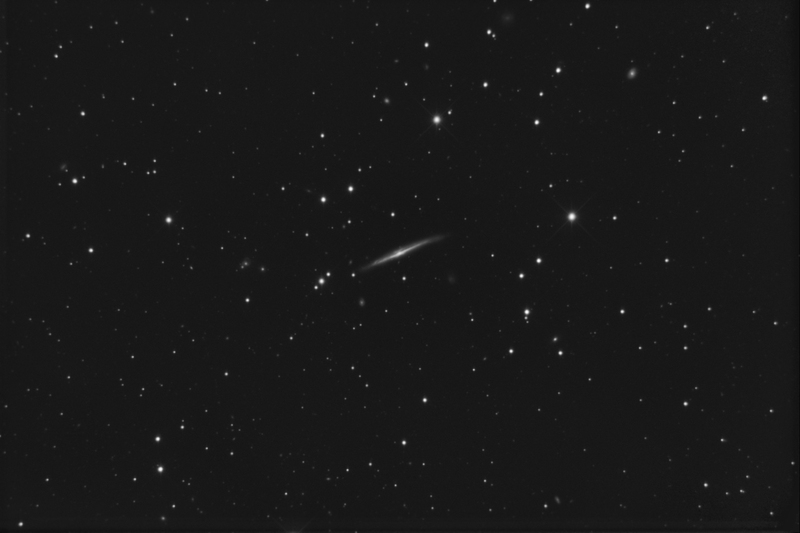 This magnitude 12.5 galaxy appears as a thin sliver and resides 144 million ly away. Less than a degree to the south is NGC 5533 which is a spiral galaxy about half the width as the previous target. It measures 3.1 by 1.9 arc minutes and is an estimated 162 million ly away. 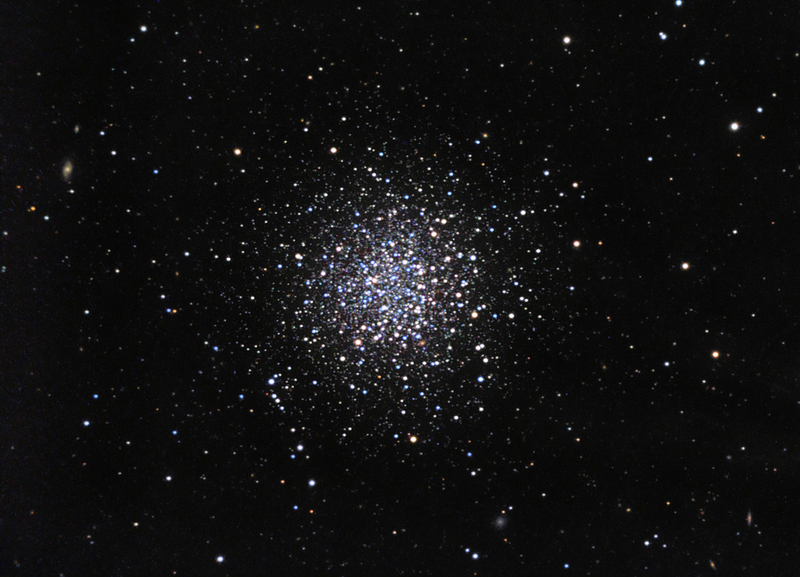 The only globular cluster found in Bootes is NGC 5466. At an estimated distance of 52,000 ly, this loose globular appears about a third the width of the full moon and is listed as magnitude 9.1. Bootes also plays host to a good selection of double stars. The best example is Kappa and Iota Bootis. Located very close to the end star Alkaid of the Ursa Major, these are indeed doubled stars of their own. Kappa consists of magnitudes 4.6 and 6.6 separated by 13.5 arc seconds. Iota consists of magnitudes 4.8 and 7.4 with a nice separation of 38.7 arc seconds. Epsilon two components of gold and blue are magnitudes 2.6 and 4.8 with an extremely close separation of only 2.9 arc seconds. A moderate sized telescope is required for this one. There are other double stars to choose in Bootes. Even though the red planet Mars, presently found in Scorpius, was at opposition on May 22 and closest to Earth at 75.3 million kilometres on May 30, it will still light up the night sky all summer long. Do not confuse it with the magnitude 1.05 orange star Antares, a red giant 554 ly away and deemed the heart of the Scorpion. As the Earth-Mars distance increases over time, Mars slowly dims and will fall to magnitude zero by mid September. Mars at the beginning of June shines at magnitude -1.76 whereas Jupiter is at magnitude -1.63. Speaking of Jupiter, it is still high in the sky at sunset but is now past the meridian. Jupiter sets at 1:45 a.m. on June 1 and 11:45 p.m. at month’s end. One can still follow Mars as it retrogrades (moves west) over the next few weeks until the planet becomes stationary on June 30. From here the red planet begins its usual eastward motion. This dance of the planet is the result of Earth moving faster in our orbit around the Sun and overtakes Mars during these close approaches. Jupiter and Saturn also do they respective oppositions but to a lesser degree as they are farther away and take longer to orbit the Sun. Never the less, it is fun to follow and image the shift against the background stars. 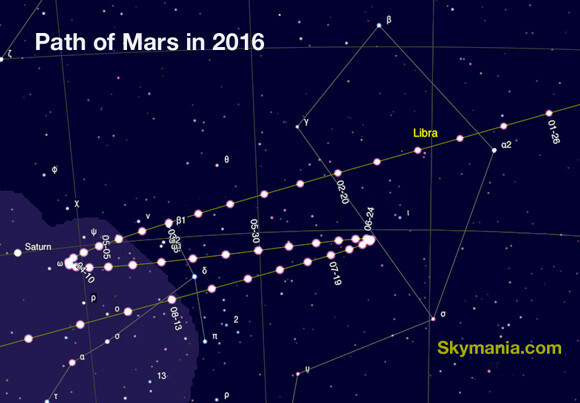 Next opposition for Mars will occur on July 27, 2018 when the red planet comes even closer and appear larger than now. With all the hype of Mars, let us not forget the lovely ringed planet Saturn. It is at opposition on June 3 meaning it rises in the south east at sunset and is up all night long. The majestic rings are now wide open at 26.1 degrees. 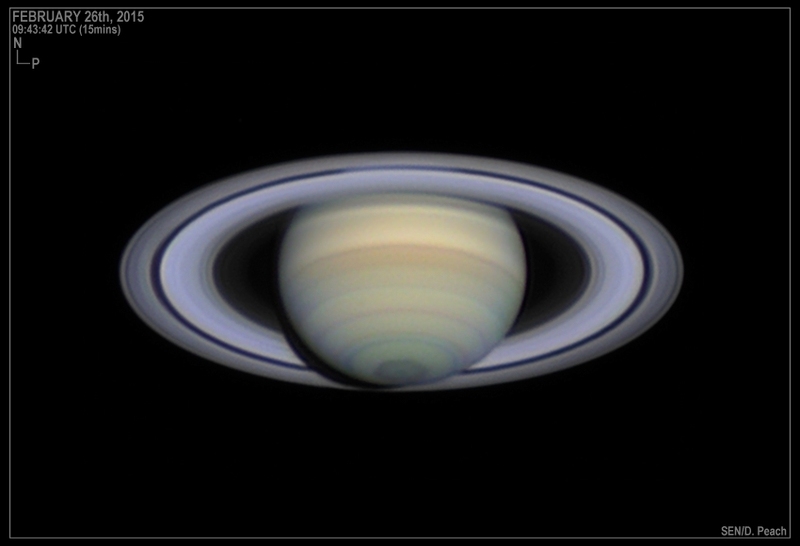 With this maximum tilt along with its moons, Saturn is always a fantastic object in a telescope. Planets are always the public’s choice of telescope objects at summer star parties and with three bright members of our solar system visible most of the night; you are in for a treat. In fact many first time attendees at a star party are surprised they can see the planets (with the exception of Uranus and Neptune) with the naked eye. The planet Venus is dangerously close to the Sun and about to pass behind the Sun. Do not attempt to locate it. Venus will be seen in the western sky in July and pairs up with Mercury on the 15th. Mercury will be at greatest elongation on June 5. As a challenge, try spotting Mercury about two degrees above the 4.6% thin sliver of a waning crescent Moon as they rise in the NEE sky at 4:45 a.m. eastern time on June 3. You will also be battling the brightening sky. The summer solstice occurs on June 20 at 22:34 UT. Observing nights are now at their shortest but things turn around as daytime hours begin to shorten. New Moon (lunation 1156) occurs June 5 at 3:00 UT. The Full Strawberry or Honey Moon lights up the night sky on June 20 at 11:02 UT when it will be 400,740 km from Earth.